In February 1848, George Mink let the public know that he had “removed his Tavern and Livery Stables to the new Stone House in Clarence Street, (sign of the Telegraph House,) Directly opposite his Old Stand…. “Stage Extras, Covered Carriages, Double Waggons, Light Buggies and Saddle Horses obtained at any hour of the day or night.” The location, according to land registry and assessment records, was lot 219, the middle lot on this block. Shortly thereafter, he won the contract for the mail route between Kingston and Brighton, running through Adolphustown and the Prince Edward District. Five two-horse carriages were assigned to the route. While his business interests were progressing nicely, George experienced great tragedy in his personal life. His only son, George James, died in January 1847 at the age of four. Nancy Mink, his mother, passed away at Newburgh on 9 August 1849, followed two days later by his wife Ellen (with whom he also had three daughters) from the effects of cholera. In December 1850, a signed requisition appeared in the British Whig, urging him to run as Alderman for Ontario Ward in the coming election. Commented the Whig, “the presence of a respectable, well-conducted man, like Mr. George Mink, though a man of color, would be a comparative credit to the coming board.” Some people thought it was done as a joke, and eventually he declined the opportunity, feeling that some of the signers were actually hostile towards him and were trying to further their own party purposes. If he had become Alderman, he would have been the first black man elected to public office in Canada West (now Ontario). In September 1852, he married again. His bride was Mary Jane Adams of Toronto. 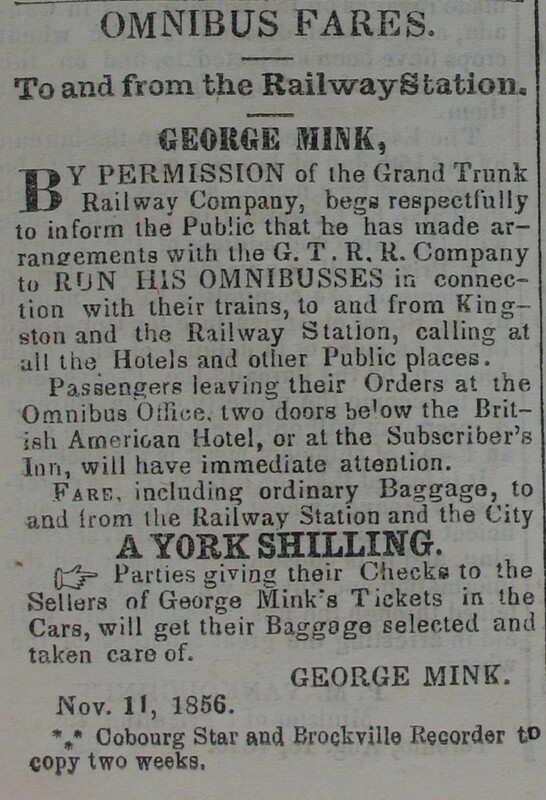 At the end of the year, George won the contract for carrying the mail between Kingston and Cobourg. He was required to make seven trips per week, the route to be completed within 19 hours in summer. John A. Macdonald, who later became the first prime minister of Canada, was one of his sureties. 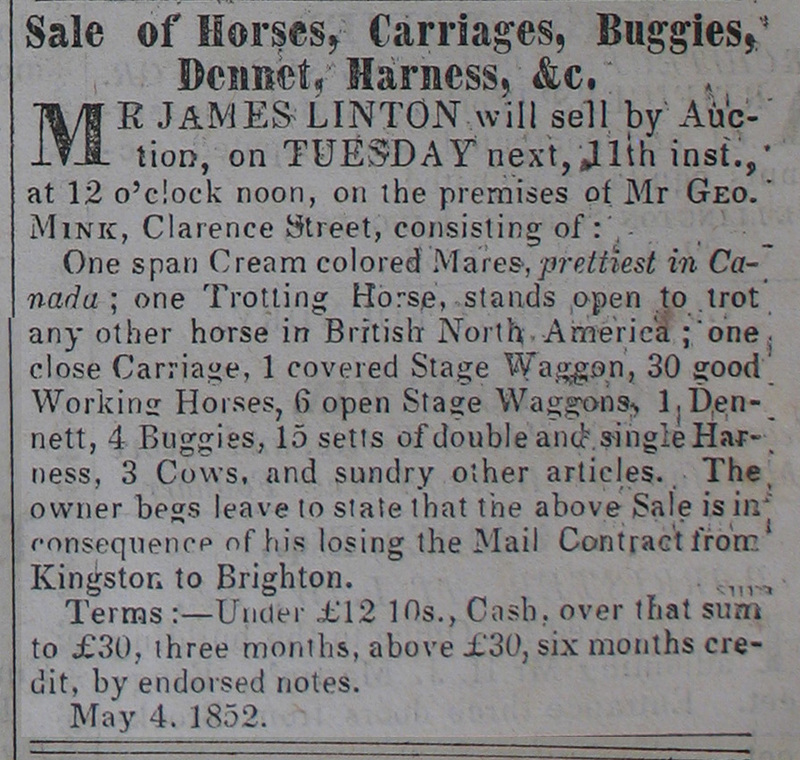 Late in 1853, he picked up the contract for the Kingston-Montreal route. Extra business required more room; he rented property from Thomas Askew on Clarence Street to use as a stage office. The Address 140 Clarence Street has been chosen as it plots as being located in about the centre of the post office block on Google maps. The following data is extracted from The Canada Directory, containing the names of the professional and business men of every description, in the cities, towns, and principal villages of Canada. November 1851.